Brambleton offers single-family homes and townhouses right near plenty of shopping, entertainment, and dining options. Trails, parks, and community pools are all nearby, as well as schools and a health club. There’s a special community within Brambleton designed especially for 55+ living, Birchwood at Brambleton. Lots of events are hosted for residents (and sometimes the general public) every month, like pool parties, campouts, wine classes, an annual Fall Festival, farmers markets, holiday parties, and carnivals. The beautiful apartments at The Village at Leesburg have direct access to over 60 shops, restaurants, amenities, and a Wegmans. Entertainment options include a movie theatre, Bowlero bowling alley, and live music and entertainment at Smokehouse Live. There’s a farmers market on Wednesdays, public splash pad in the summer, public events like the Christmas Tree lighting, and the Great Grapes and Grains Wine and Food Festival. The Discovery Square townhomes are located right across from the Steven F. Udvar-Hazy Center branch of the Smithsonian Air and Space Museum. The townhomes are 4 levels and include rooftop terraces and state-of-the-art finishes. Just minutes away from the Fair Oaks Mall, Dulles Town Center, Reston Town Center, and Leesburg Outlets you can find anything you’ll ever need within 10 minutes of home! It’s an ideal location for commuters and travelers, being just two miles away from the Silver Line Metro and across the street from Dulles Airport! Willowsford is a collection of neighborhoods all built around the ideas of conservancy, sustainability, and getting back to nature—90% of their homes back to open space. The neighborhoods are all built around a farm, and residents get first pick of produce from the farmer’s market as well as the ability to take cooking classes at the Willowsford Kitchen. About 2,000 acres of wildlife habitat are protected by the communities, which feature a range of recreational amenities and lifestyle activities often based around the outdoors. The Grant neighborhood in Ashburn and Aldie features the Grant Farm, the Everfield Community Park, Conservancy Camp Site, a disc golf course, and 13 miles of trails. The Grange neighborhood in Ashburn contains The Grange Farm, a farm market and garden, Sycamore House and Pool, a teaching and demonstration kitchen building, a kids’ BMX bike track, and 9 miles of trails. The Grove, in Aldie, features the Pin Oak Community Park, 5 miles of trails, Overlook Knoll Park and Zipline, Swart Farmstead Historical Site, and picnic areas. The Greens neighborhood in Aldie has The Greens Farm, The Lodge and Fitness Center, The Lodge Pool & Spray-n-Play, a teaching and demonstration kitchen, Willow Lake, parks and sledding hills, and 14 miles of trails. For anyone looking for a luxury home in a down-to-earth environment these communities are perfect! Potomac Shores is located just 30 miles away from D.C., ideal for commuters! This community has over 2,000 miles of woodlands, water views, and shoreline as well as an extensive biking and walking trail system. There’s a public Jack Nicklaus Signature Golf Course and Clubhouse, a private social and recreation center, scenic pond, and canoe club. Covington-Harper Elementary School and Saint John Paul the Great High School are already on the grounds, as well as several sports fields, and there are future plans for a middle school to be built. There are future plans for neighborhood parks, shopping areas, a hotel, an on-site VRE station, corporate campus, and marina. Lenah Mill is luxury living minutes away from all the shopping you could need, golf clubs, wineries, and Dulles Airport. This community has a variety of amenities, including the Lenah Mill Club with competition and leisure pools, basketball courts and sports fields, community common space and a conference room, a health and fitness studio, a tennis pavilion, a kids’ adventure park, and tot lots for young kids. If your family are outdoorsy there are plenty of opportunities to get fresh air! Walk the Berry Garden Trail, take a canoe out on Cedar Lake, plant in the community garden, go to the dog park, fish the fishing pond, or enjoy the hiking and biking trails. Dominion Valley is an award-winning resort-style community especially great for anyone who loves to golf, as their development features a 36-hole Arnold Palmer Signature Golf Course. The community will support your lifestyle with a luxurious clubhouse, pools, tennis and basketball courts, a sports pavilion, fitness center, and onsite dining and shopping at Market Square. Great features for families include brand new schools in the area and tot lots for those with young kids. They’re also embraced their use of outdoor space with neighborhood parks, Silver Lake, and miles of hiking and biking trails! One Loudoun is a walkable, mixed-use community ideal for D.C. commuters as it’s situated right near Route 7 and the Loudoun County Parkway. The shopping center features all the shopping, restaurants, entertainment options (including a movie theatre), and social opportunities anyone could ever need. Nearby schools, a nature conservation area, The Barn Amphitheatre, plenty of sports and fitness facilities, parks and dog parks, biking/running trails, and green spaces attest to the well-roundedness of this planned community. Brookside is a beautiful 1,000 acre planned community with miles of lakefront homes, wildlife preserves, and fitness trails. The Spring Valley Park and Trail System is an easy way to walk or bike to anywhere within the community. Amenities within walking distance include basketball and tennis courts, soccer fields, miles of paved walking trails, playgrounds, lakes, a fishing dock, fitness center, a fishing pool, and two clubhouses. There are four spring-fed lakes within the community and 80-acre Lake Brittle just outside, so even if you commute into D.C. you’ll be able to get your nature fix any day of the week! Luxury homes, townhomes, and condos can be found at Loudoun Valley, a neighborhood that combines urban living with the tranquility of nature. Luxury amenities include a clubhouse with pools, tennis and fitness centers, tot lots, parks, and walking and biking trails. There are also on-site schools, and proximity to grocery stores, shopping, and entertainment for your convenience. This community boasts over 300 acres of nature preserve, and is just minutes away from local golf courses and the 45-mile long Washington and Old Dominion Trail. The apartments at Dulles Greene offer resort-style luxury living in the heart of Herndon’s amenity-rich area, very close to the Dulles Toll Road. The spacious, garden-style apartments feature great views and are all pet-friendly! The community clubhouse is newly renovated and includes a coffee bar, fitness center, yoga room, and theatre room. Dulles Greene also has a pool, outdoor hot tub, outdoor fire pit, grilling and picnic areas, playground, sand volleyball courts, tennis courts, and more. Surrounded by restaurants, shopping, parks, golf courses, and walking trails, you’ll always be able to find something to do! There’s also plenty of planned social activities for residents—like movie nights and barbecues. Moorefield Green has luxury homes with rooftop terraces surrounded by picturesque views and rolling hills. 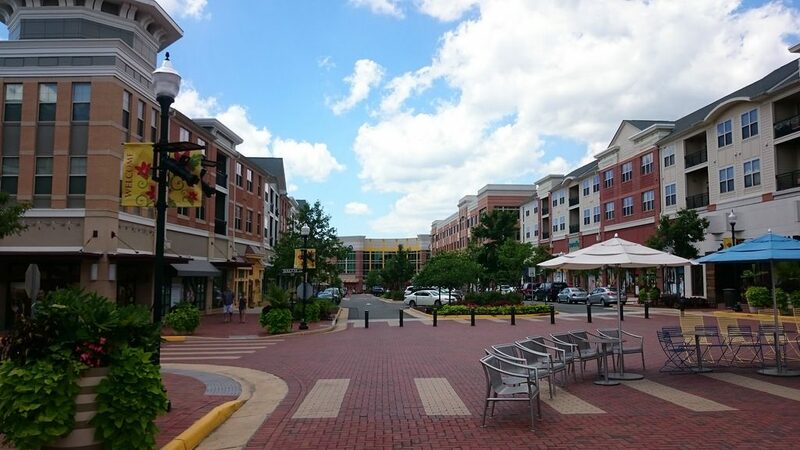 Very pedestrian-friendly and within walking distance of shopping, dining, and top-rated schools—AND only one mile away from the future Ashburn metro station! The community features luxury townhomes, courtyard patio homes, and single-family homes that have access to many amenities. Some of these include a clubhouse with fitness center, club room, pools, a tot lot, walking trails, and pocket parks throughout the neighborhood.